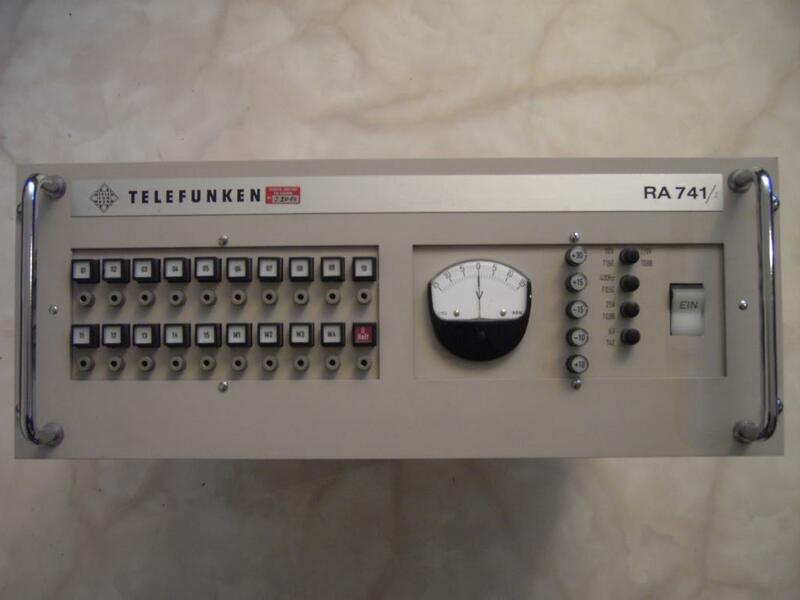 The RA741 is the direct predecessor of the TELEFUNKEN RA742 analog computer and the successor of the RAT700 analog computer. About 15 years ago my friend Christian Peters spent a whole day to help me rescue an RA741 analog computer from the university of Aachen. Since then this machine sat in my hallway and was waiting for its resurrection. Somehow I was afraid of beginning this task - do not ask me why. Last week I took one week off from work (for the first time in my life :-) ) and decided to use this spare time to try to get the system up and running again. Fortunately I had another RA741 in parts which was very useful in repairing this one. 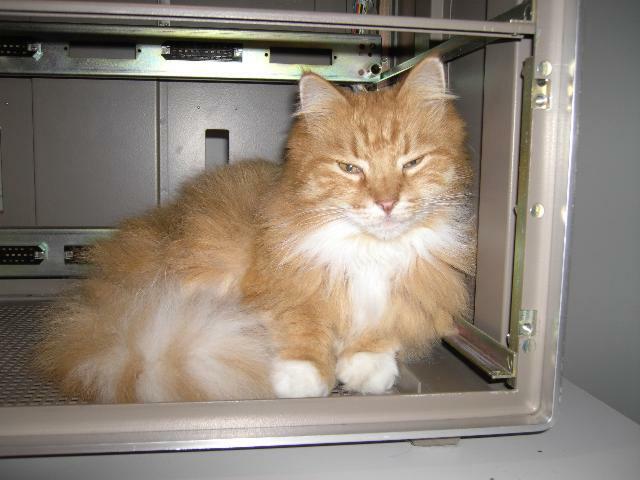 Whenever I attempt to restore an old computer I will never just switch it on - it is way too dangerous since failures and errors might destroy other circuits leading to sheer never ending trouble. So the first thing I always have a look on is the power supply which is located in the right half of the upper drawer shown in the picture on the left. 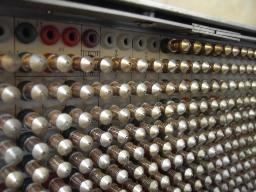 The left half of this drawer contains fifteen of the operational amplifiers of this computer. 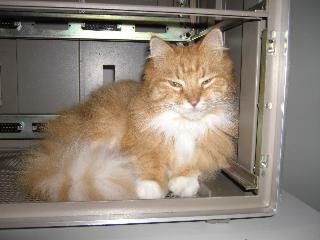 The picture on the right shows the innards of the upper drawer (the front panel is on top of the picture). 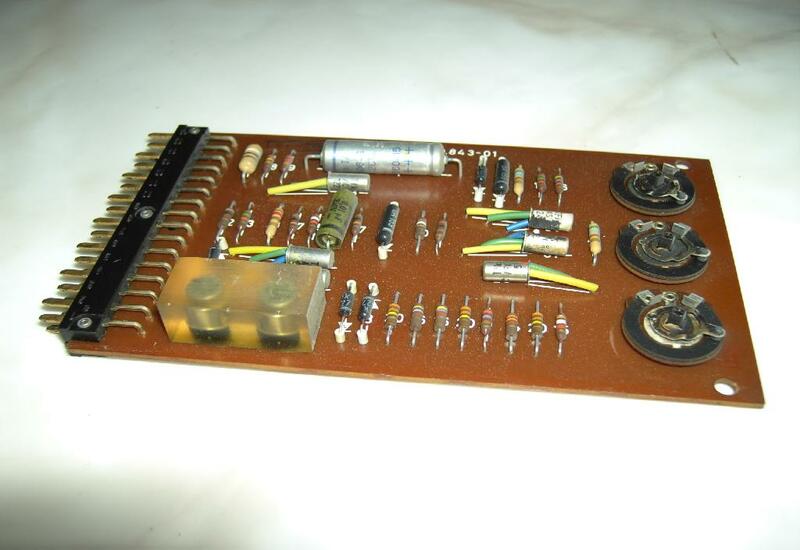 On the left hand side are the large filter inductors and the silicon rectifier diodes. 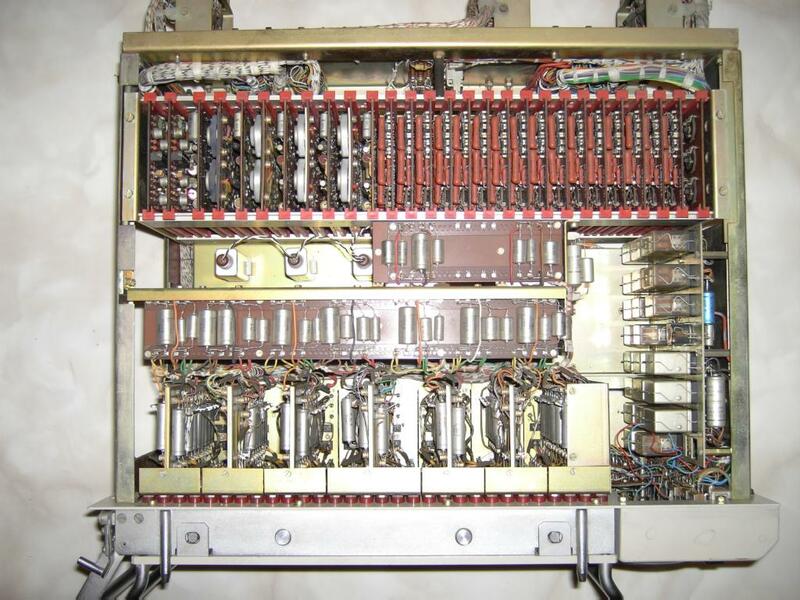 Next to this is a card cage holding the regulator cards and some additional circuitry for the power supply. 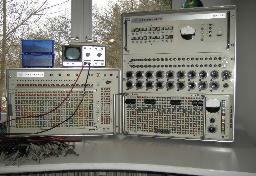 The two card cages on the right hand side of the picture hold the 30 cards representing the 15 operational amplifiers. 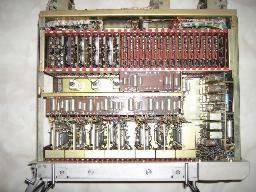 Each amplifier consists of a main amplifier and an auto-zero (support) amplifier as well as one half of a chopper relais (these special purpose relais can be seen between the two operational amplifier card cages). To understand the following odyssey a tiny bit of theory concerning the implementation of low drift (auto zero) amplifiers is required. The picture below left shows the main amplifier part of an operational amplifier of the TELEFUNKEN RA741. 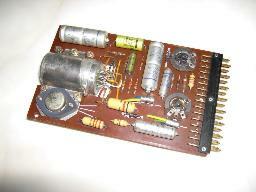 On top of the card are two high power Germanium transistors which form the output stage of the amplifier. This card alone could act as an operational amplifier (with quite impressive technical data even for for today's standards). 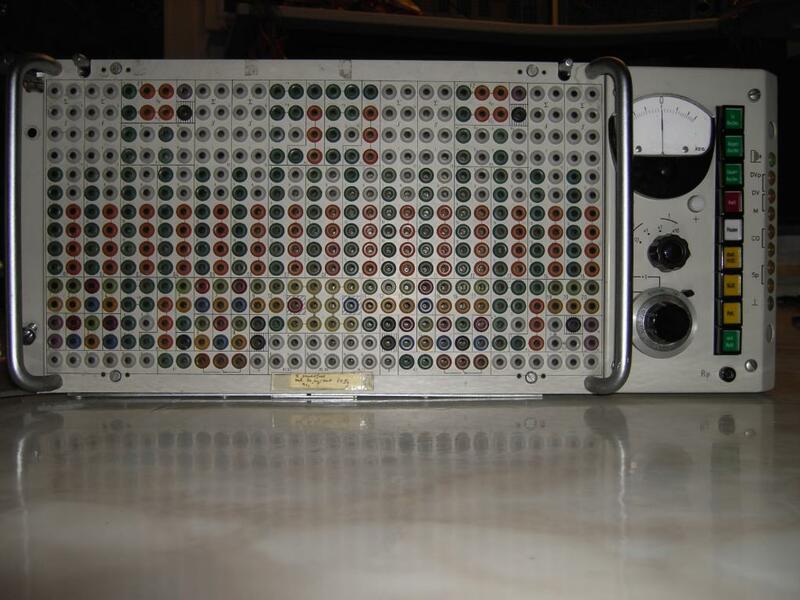 But this amplifier would suffer from drift as every simple operational amplifier does. Drift is a real problem in analog computation since errors caused by (temperature) drift effects will accumulate in the integrators and render calculations useless. In normal consumer applications this drift poses no problems since all amplifiers in these application areas are capacitively coupled to their surrounding circuitry so DC drift is no problem at all. A normal operational amplifier with feedback will try to hold its input at ground potential (due to its idealized infinite amplification). If an amplifier drifts away this drift will look like an error voltage on the amplifier input. If one could remove this error voltage (tying the input to ground is not a good idea :-) ), the drift problem would be cured. How can one measure the error voltage at the input of the (main) amplifier, amplify it and produce a correction signal? This would require a DC coupled amplifier which would have a drift problem and would thus require some corrective measures against its drift, which in turn... So it is not that easy. One thing which comes to help is the observation that drift voltages at the summing junction of the main amplifier are very (very!) 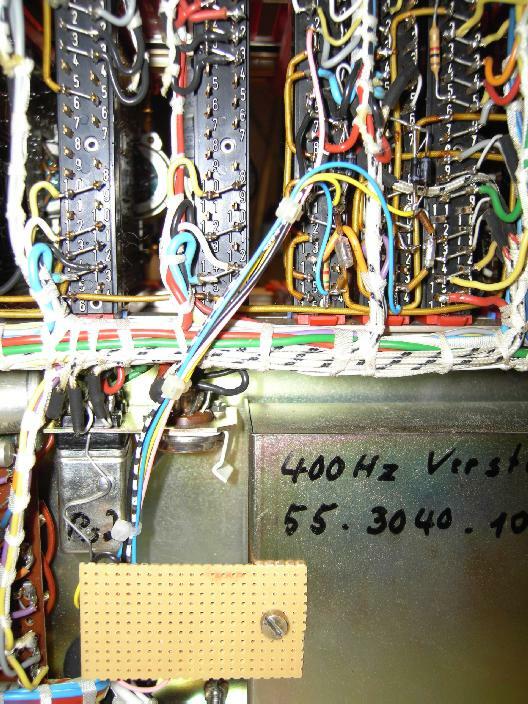 low frequency voltages. So one could use a chopper to convert this near DC voltage at the summing junction to an AC voltage, amplify this voltage with a drift free AC coupled amplifier (the auto-zero amplifier) and rectify the output of this amplifier to get a DC voltage which can then in turn be used to automatically adjust the main amplifier. When this has been done, the next step involves decoupling the main amplifier by preceding it with an input capacitor so this amplifier will not amplify DC voltage levels at all. 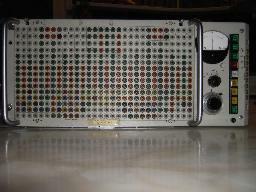 (Please note that DC amplification is necessary for an electronic analog computer - OK, there are exceptions, but...). What happens now? The main amplifier does not amplify DC signals but these will be chopped, amplified by the support amplifier and rectified to generate a correction signal which will be fed into the main amplifier which, in turn, will do its best to establish a ground potential at the summing junction. If the frequency of the input signal gets higher, the main amplifier will take over the main load while the support amplifier will start to amplify the drift caused error signal only (the input to this amplifier is blocked for high frequencies by means of a low pass filter). So both amplifiers act hand in hand. 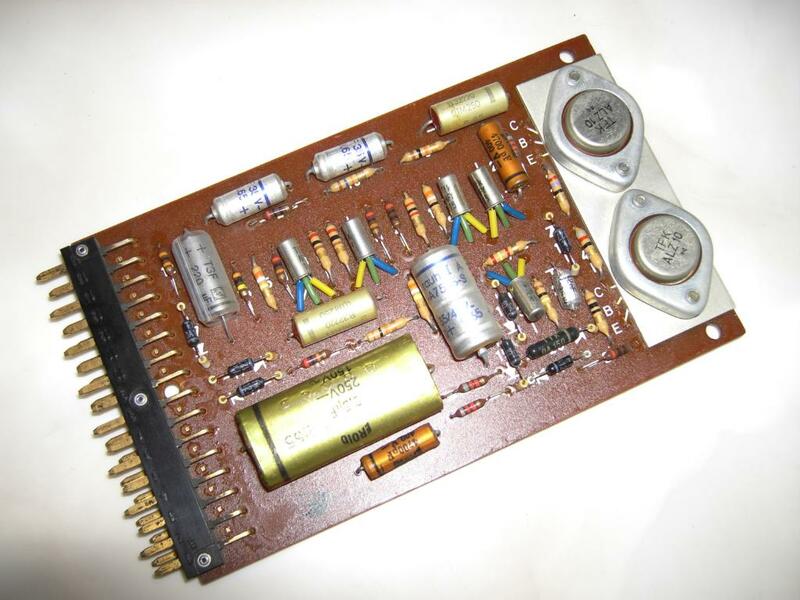 For low and medium frequencies their respective amplification rates will sum up, yielding an incredible amplification rate of 1000000000 (yes - 10 to the power of 9) for this old amplifier (which is about 1000 times better than what most modern operational amplifiers can deliver). All of these circuits now make heavy use of two things: A chopper to convert the DC drift voltage to an AC voltage and a synchronized rectifier to convert AC into DC again. The chopping is done with electromechanical chopper relais switching 400 times per second (!). These are very special devices which require a 400 Hz supply voltage. The synchronous rectifier will use another 400 Hz voltage with a well defined phasing with respect to the chopper voltage. The picture on the right shows the support amplifier which is used to amplify the drift signal present on the summing junction of the main amplifier shown above. The input signal to this support amplifier has already been chopped by the electromechanical chopper relais so this amplifier can be connected as an AC coupled (and thus drift free) amplifier. 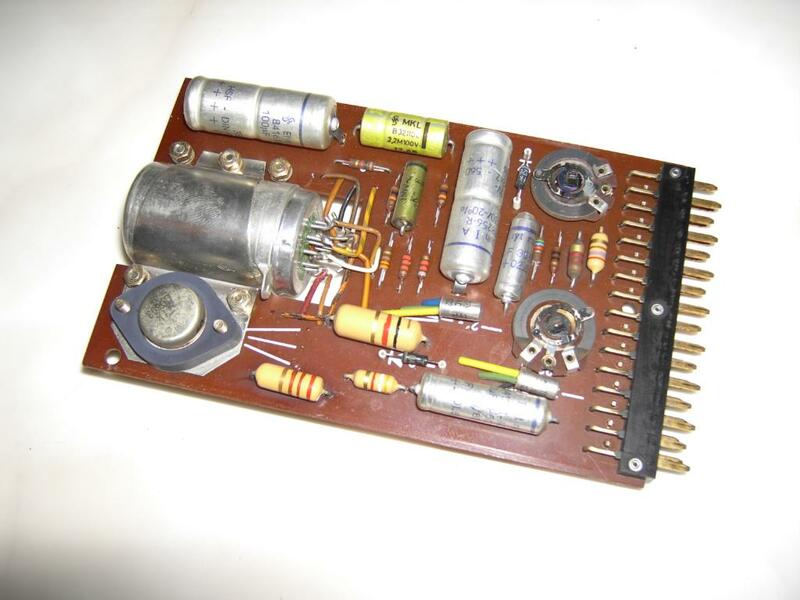 The output signal is then rectified (note the two black Germanium diodes on the left hand side of the printed circuit board) and fed back to the main amplifier. Unregulated voltages for powering relais and lamps. 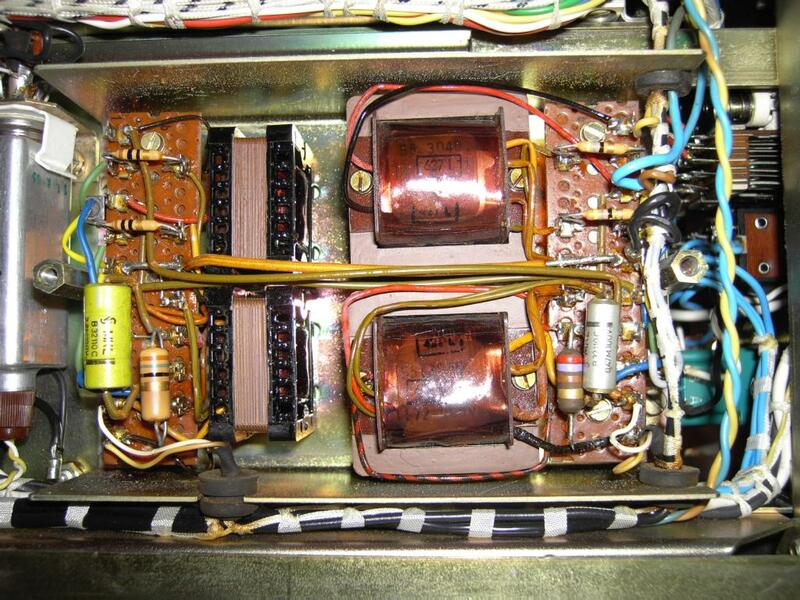 Two highly stabilized voltages of +10 V and -10 V respectively. 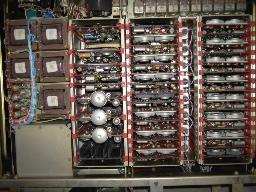 These voltages represent one positive and one negative machine unit and are the basis of all calculations. The regulators for these voltages make use of drift corrected operational amplifiers! Having set the stage the drama can begin. 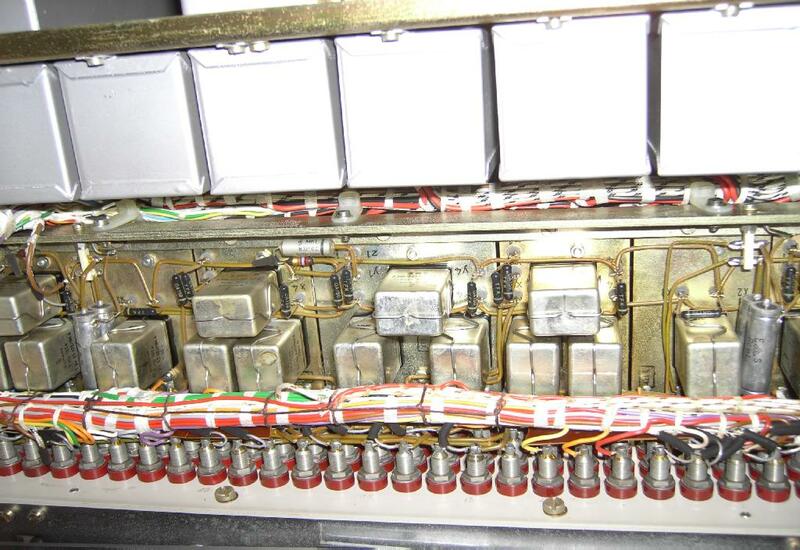 :-) When I first switched on the upper drawer (removed from the rack), all voltages very erroneous (prior to this I removed all 15 operational amplifiers to make sure those would not be damaged should something really go wrong in the following). All relais and lamp voltages were present and in range. +30 V was there and in range, too. -15 V was OK, too. +15 V was only about 7 V and was quite erratic. This turned out to be caused by bad contacts which was cured with isopropylic alcohol, some cotton pads and quite some time. Fortunately the first thing I did was to have a look at the two 400 Hz voltages for the choppers and the synchronous rectifiers. The chopper voltage was there and looked quite good. The rectifier control voltage looked horrible and was only 200 Hz which was interesting since both voltages are derived from a single signal source. :-) It took me about two hours to understand the 400 Hz generator circuit - just to realize that it should work but it did not work. 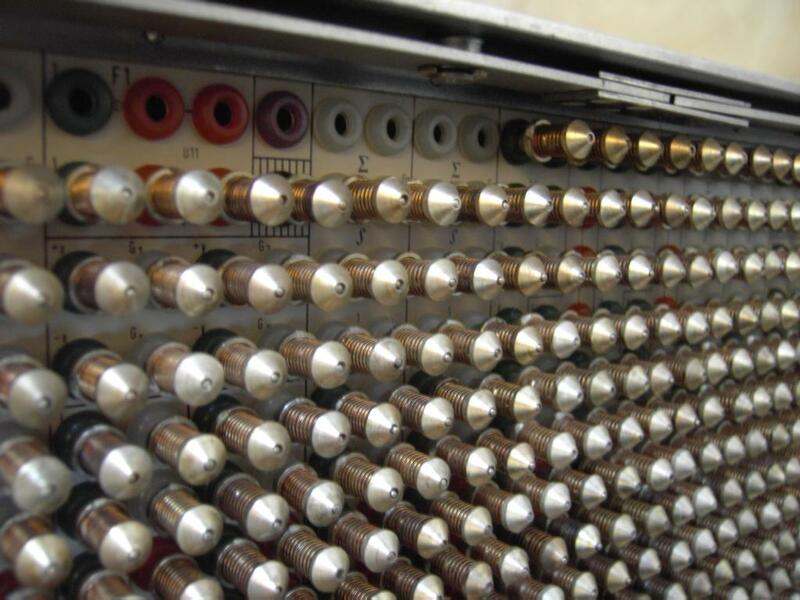 Half an hour later I found out - by mere accident - that one of four potentiometers needed to set frequency and phasing had deteriorated during the last 40 years (that is not what I would call quality :-) ). Cleaning the slider and the sliding surface cured that and both voltages had the correct waveform at the outputs of the 400 Hz generator card. Alas - the +/- 10 V power supplies still did not deliver +/- 10 V. So I turned my attention to the two operational amplifiers (again) - this attempt can be seen in the picture on the left (please note the yellow cable leading to the upper plug on the back of the drawer - whenever you want to run the upper drawer removed from its rack, be sure to ground pin A4 of this jack to energize relais 2 which will cause the internal voltage reference to be used - otherwise the +/- 10 V levels will be undefined - this feature is used to connect several RA741 in parallel with one computer being master and defining the signal levels). After some experimentation it turned out that both operational amplifiers were defective (by the way - here only the support amplifier part of a complete operational amplifier is being used - the voltage regulator acts as the main amplifier). The two pictures below show my solution. In the picture on the left two OPA27 integrated circuits mounted on a small piece of pertinax board can be seen. It turned out that these two amplifiers worked perfectly in this ciruit so I decided to quit thinking about debugging the two original operational amplifiers and use this solution instead. The picture on the right shows the final solution - the two OPA27 have been mounted on the frame of the 400 Hz amplifier (the writing on the case is not from me). Please note the empty tube-like relais socket on top of this contraption. 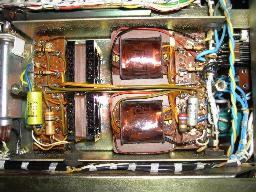 This is where the now useless chopper relais was mounted which supported both of the regulator amplifiers. 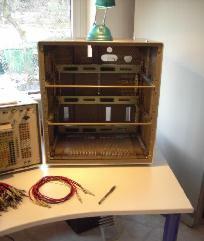 The picture on the right shows the front plate of the power supply part of the upper drawer. 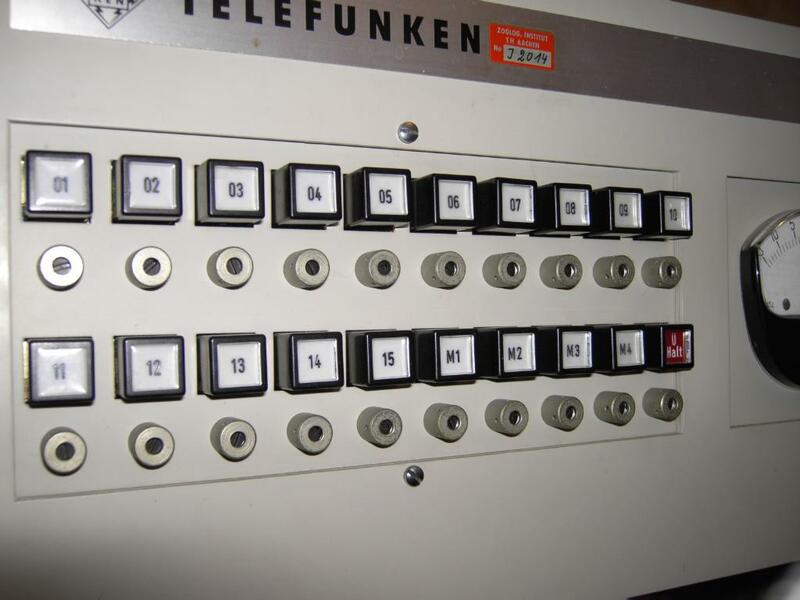 When powering it on all voltages are present after a couple of seconds (when you do this and hear a relais clicking for some seconds, this is perfectly normal - TELEFUNKEN used a relais to artificially unbalance the +/- 10 V regulators to force the circuit into regulation - so these two voltages will come last and only after the clicking stops). After fixing the power supply I inserted the 30 cards of the 15 operational amplifiers. The picture on the left shows the front panel of the amplifier half of the upper drawer. 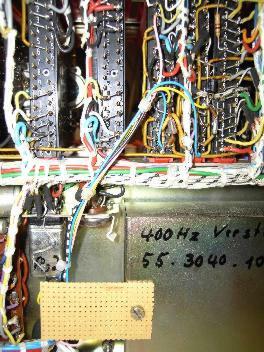 Each amplifier has one overload indicator (a push button which will cause the output of the amplifier to be connected to the readout bus when depressed) and one balance potentiometer (below the push buttons). When switching this drawer on, all overload indicators should light for a moment and then extinguish. Some of mine did not but fortunately I had three spare amplifiers which I used as replacement parts. After swapping these boards in, the upper drawer was operational again which I checked by testing each amplifier with a 1 kHz sinusoidal input signal of 100 mV amplitude as input. Each amplifier got its own feedback network to ensure an amplification of ten as a test bed. The picture on the left shows the top view of the lower drawer (the patch panel is at the bottom of the picture). 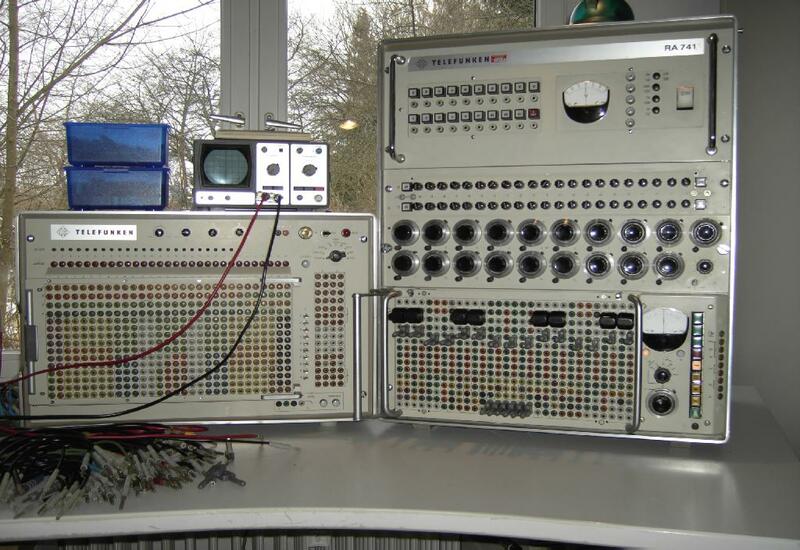 On top of the picture the card cage holding two relais comparators, four operational amplifiers (for the parabola multipliers), the sixteen parabola function cards comprising four multipliers and the special comparator for the timing generator can be seen. Below left of this card cage three chopper relais can be seen. 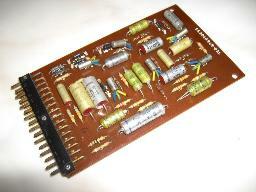 Below this the precision resistors and capacitors of the summers and integrators are located. 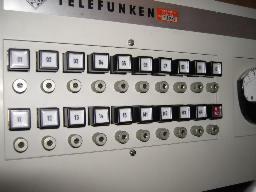 The main timing control of this analog computer is based on its integrator number 15 which is placed into a special timing mode according to the settings on the control panel. This integrator will generate a ramp from -10 V to +10 V. When it reaches +10 V, the compute cycle will be stopped and the computer will either halt or start the next compute cycle. 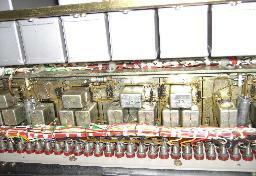 At the heart of this circuit is a precision comparator which can be seen in the picture on the right. Please note the epoxy block containing two transistors - this was not done to couple them thermally together, it was rather done to prevent changing only one transistor of this matched pair. Should one transistor fail, always both transistors had to be changed. 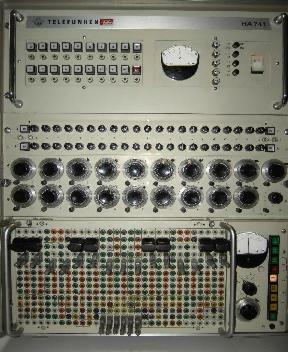 After both the upper and lower drawer were operational again I mounted them in the rack and the resulting system looked like shown in the picture on the left. As you can see I made a simple test circuit to test all of the computational amplifiers one after the other. 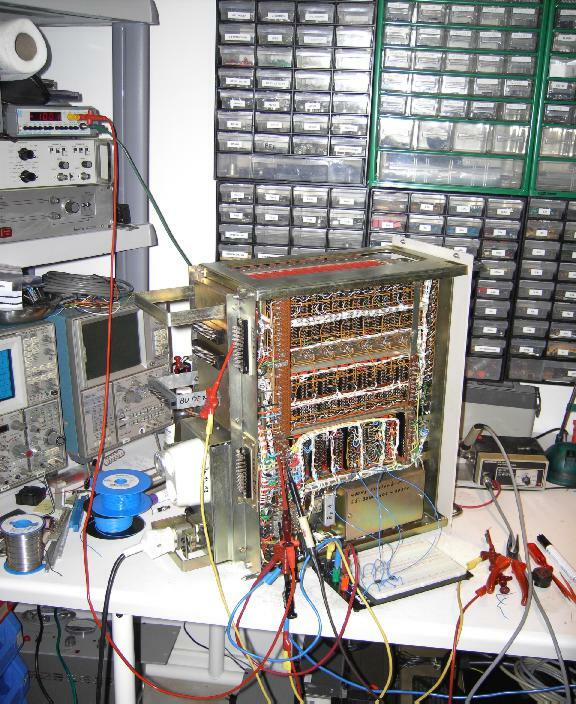 After these tests were successfully completed, I reinserted the middle drawer containing the two variable function generators and the 20 coefficient potentiometers (which are very deteriorated - if you ever have some spare 10 turn potentiometers, please let me know :-) ). 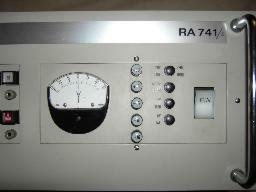 The resulting system can be seen in the picture on the right - on the right hand side is the RA741 in all of its glory. 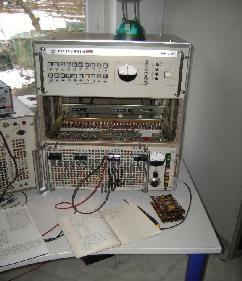 Left to it is a DEX100 which has not yet been connected to the analog computer. On top of this sits a small oscilloscope. 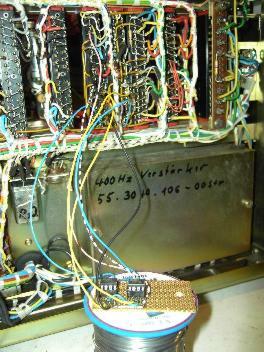 All in all this restauration effort took me three whole days (and most of the nights, too :-) ), it made me a bit wiser concerning some TELEFUNKEN circuits and it caused me some additional grey hair. 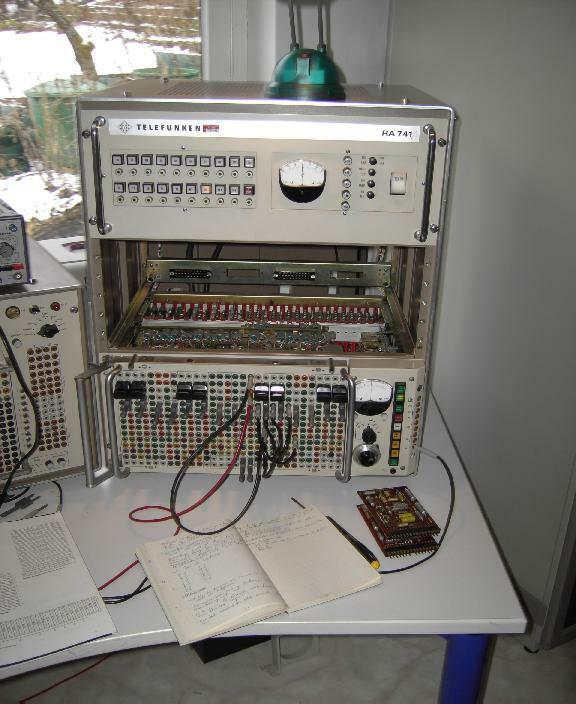 :-) All in all it was a wonderful project and I am incredibly happy to see this wonderful machine being operational again after tens of years sitting in various storage locations and I am really looking forward to solve some differential equations on this wonderful system. 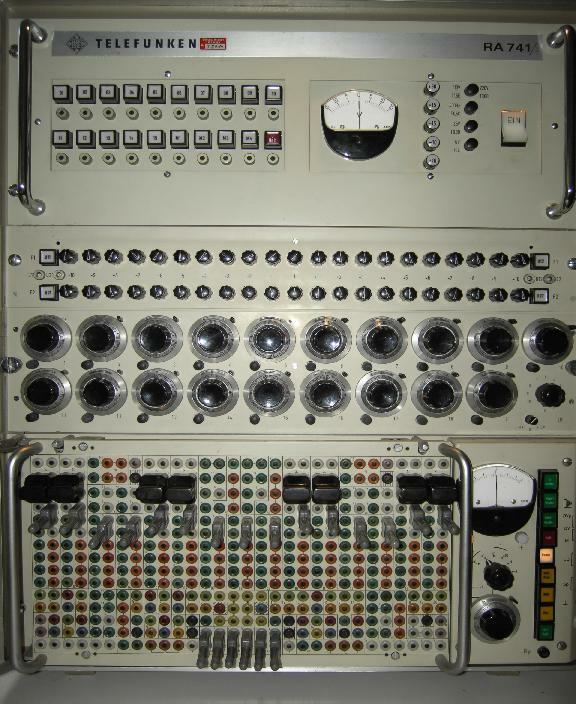 Please, when you hear or know about an analog computer looking for a good new home, send me an email. 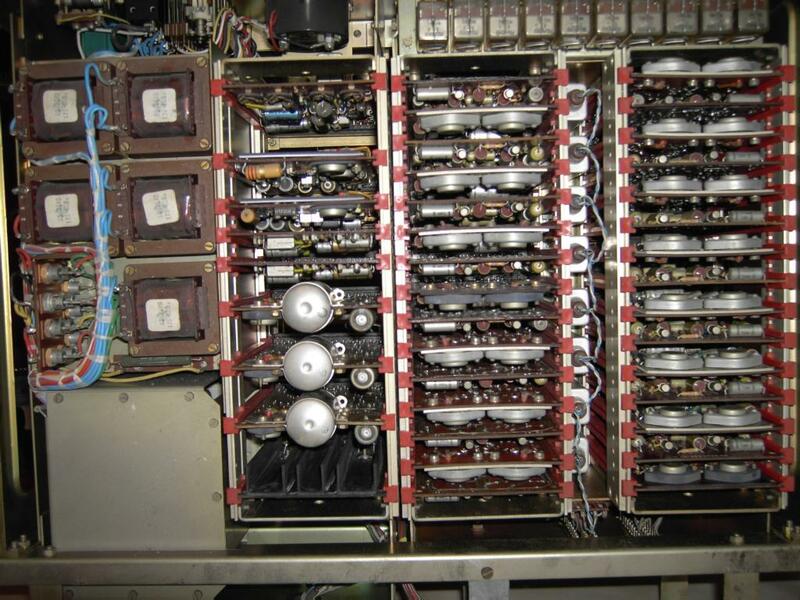 I do my very best to save these wonderful machines from scrap and I will always try to get them up and running again.